As a web designer, I have seen hundreds of photos of some of the most beautiful places in and around the Caribbean, but when I started planning my honeymoon there really was no question to where we would be going. I became mesmerized by a tiny little island in the Caribbean and courtesy of Wimco, my dreams became a reality and we booked our trip to St. Barthelemy. Robyn: Before I had come to work at Wimco, I really didn’t quite know what a villa was. You have this impression in your mind that a villa is just for the rich and famous, but really a villa vacation is within reach. Now that we’ve gone down that path, I’m not sure we’ll be able to go back to an ordinary hotel vacation. 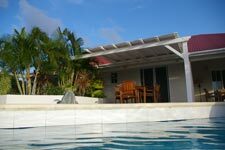 Our stay at Villa SAS spoiled us to say the least! Erik: From the enormous living room, gourmet kitchen, numerous decks, private pool and Jacuzzi, I truly felt like I was living the ‘high life’ in one of the most beautiful settings I have ever seen. One of my favorite memories will be relaxing in the infinity pool that seemed to extend directly into St. Jean Bay while sipping on cocktails and watching the tiny planes take off and land at the airport. Robyn: Talk about luxury living! Every morning I awoke to a gorgeous view of St Jean Beach. The villa also had a perfect sitting area to read. We each read two books during our five-day stay on the island. I can’t forget to mention the provisioning we had on the first night…an absolute must!! We were so exhausted after traveling from Denver that once we got to our villa there was no way we wanted to start worrying about where to go eat dinner. Instead, we popped the cork on the champagne, broke out the baguette with a selection of delicious fresh cheeses from the fridge, shed our clothes, and jumped into the pool. What a way to begin our honeymoon! Robyn: Unfortunately since it was the low-season on the island, most of the restaurants were closed. But that did not stop us from having incredible meals. 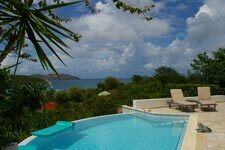 Erik: The food we discovered in St. Barts is truly top notch, gourmet fare. Robyn and I were never disappointed at any restaurant, but I have to say that I kept finding myself at Chez Andy’s Hideaway. After a long day at the beach, the fun atmosphere coupled with delightful service and some of the best pizza I ever had will be hard to forget. 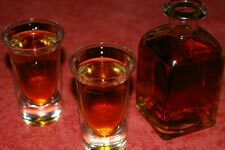 Robyn: Yeah, not to mention that Erik became friends with one of the servers at Andy’s, so the small carafe of vanilla rum you get at the end of the meal doubled by the end of our trip. Their fresh seafood and salads should not be missed, but on the last day it was no question that we wanted to enjoy that pizza one last time. 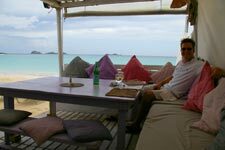 One of my favorite meals was at La Plage at Tom Beach Hotel. You can’t beat eating right on the beach in couches watching the planes take off almost right over your head. I ordered the Lobster Risotto special (which was awesome) and Erik enjoyed a pretty tasty Lobster Burger. Erik: Our most romantic meal was spent at the chic K’fe Massai. Prior to dinner we enjoyed the safari inspired, almost primal, atmosphere over perfectly concocted tropical drinks at the bar. Their extensive wine list was superb and many were reasonably priced. Our server recommended the Chef’s special entrees over the menus, but either way you pick three courses: appetizer, main course & desert. I can’t say enough good things about the perfectly seared filet mignon topped with toasted foie gras finished with a rich and gooey chocolate molten cake for desert – superb. 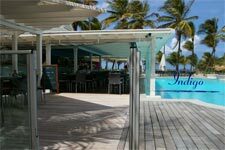 Robyn: We shared another fabulous meal at l’Indigo at the Hotel Guanahani. Our table was right next to the pool that overlooked another beautiful beach. We were given a gift certificate to l’Indigo from my co-workers at Wimco, so we ordered a great bottle of wine, split an incredible salad with fried goat cheese, and Erik had the best tuna steak of his life. As an afternoon storm rolled in, we shared a phenomenal dessert of three different sorbets soaked in Alizé. Yum! !